One of the many questions those on Medicare or Medicaid ask is whether or not the programs will cover the cost of a fall detection device or other types of medical alert devices, like the GreatCall medical alert. 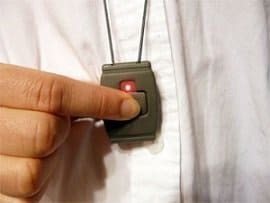 These emergency response system devices are usually worn on a lanyard around the neck or on your wrist and allow senior citizens to contact emergency services if they fall simply by the press of a button. This can be life-saving in the case where you are unable to get up or reach the telephone. Some can even have automatic fall detection which can detect when a person falls and automatically call for help. These devices bring great peace of mind and can save lives, but some people are worried about the cost. The cost of medical alert systems varies from company to company. In some instances, you will have to pay a one-time fee for the rental of the medical alert equipment in addition to a monthly monitoring fee. However, some companies will ship their medical alert devices for free, you will just have to pay for the monitoring services which may or may not require a long-term contract. So, will Medicare or Medicaid pay for medical alert monitoring? The answer is not as straightforward as one would think. Below we break down the different options you have to help pay for a medical alert device. If you are enrolled in Medicare, you will automatically be enrolled in Part A. Medicare Part A is responsible for paying for hospital expenses. More specifically, Part A generally covers items such as impatient care, nursing home stays, hospice and in-home health care. It will cover part of your care and your stay but note it does not cover doctor’s fees. One would think that a medical alert device is a tool used for in-home health care however it is not covered with Medicare Part A. If you have a question about what your Medicare coverage will actually cover, you can enter it on Medicare.gov. Medicare Part B is optional, and you are not automatically enrolled if you participate in Medicare. There is a monthly premium to be enrolled in Medicare Part B. The average premium for Medicare Part B is $134, however this could be more or less if you have a high income or if you are on Social Security. Keep in mind that this amount could go up slightly each year as rates are renegotiated. This portion of Medicare helps pay for doctors’ fees, laboratory work, x-rays, medical equipment and any services used to diagnose or treat your medical condition. It also covers preventative services like detecting the flu and treating it early on. According to Medicare.gov, Part B also covers clinical research, ambulance rides, mental health treatment and outpatient prescription drugs. Although Medicare Part B is responsible for medical equipment, neither Medicare Parts A and B will pay for medical alert devices. To find someone to talk to about Medicare, select the dropdown menu and find your state. The site will list the questions you may have along with the contact information to get the answers you need. It is possible that seniors can obtain a medical alert device through their own insurance or through one of the Medicare supplement plans (in this case, Medicare Part C). Medicare Part C, sometimes referred to as Medicare Advantage, is a private health insurance plan for those who are members of Medicare Parts A and B. The monthly premium for Part C varies by plan and your income. You can research the exact costs in your area by visiting the find a plan page on Medicare.gov. Part C includes coverage for additional benefits, including dental, vision, and hearing coverage. Private insurance and Medicare Part C may help cover the cost of a medical alert device or assist with defraying the monthly fees for a personal emergency response system. However, whether or not one of these devices is covered will vary by insurance provider. Those interested will need to find out if their insurance or Medicare Part C in their state covers a medical alert device. Check your Medicare Advance coverage or call your insurance company to inquire. Don’t be discouraged to find that Medicare and private insurance companies refuse to pay for a medical alert device. In many states and local communities, senior citizen assistance programs are set up to assist the elderly with a number of different costs, including medical equipment and medical alert devices. To find out if your state has a senior care program like this that will assist with costs, contact your local Department of Human Resources, Department of Aging Services, or other state department that is tasked with assisting the elderly. With Medicaid, it gets even more complicated. The program will pay for some medical alert devices—there are four programs that fall under Medicaid that will pay for one. If you qualify for Medicaid, you may be able to use one of these programs to cover some or all of the cost of your emergency response system. However, it depends on how the program operates in your state. HCBS Programs: Home and Community Based Services programs do offer waivers for personal emergency response services, but what those services are may differ from state to state. Many of these waivers are only available for the initial fees, not the monthly payment, but again, that may be different in certain states. Some programs give you allowance up to $75 per month to use towards your medical alert monitoring service. Other programs will give you a one-time payment to cover any equipment fees. Keep in mind the program will have a different name in each state. For example, in Alaska, the waiver program is called Alaskans Living Independently Medicaid Waiver and it does cover the cost of a personal emergency response system. However, in Massachusetts, the program called MassHealth Frail Elder Home and Community-Based Services does not. You can find your state’s HCBS waiver policy by clicking here. Consumer Directed Services: In some states, Medicaid will provide funding for the elderly without placing restrictions on what these funds can be used for beyond that they must be used for health-related costs. Therefore, the funding could be used for a personal emergency response system for the senior and they could utilize add-on services such as medication management or automatic fall detection. Check the National Conference of State Legislature site for more detailed information on your state’s policy. Money Follows the Person: This Medicaid program is designed for those in nursing homes or assisted living facilities. The aim of the program is to make it possible for these people to return to their own homes or to move in with a relative. It pays for services that go hand-in-hand with that goal, including medical alert devices. This program may be called by another name in your state so keep that in mind. There are currently six states that do not participate, and they are AK, AZ, NM, OR, UT and WY. Medicaid State Plan Personal Care Attendant Programs: Some states offer this program to help cover the cost of caregiving. These Personal Care Attendant programs vary from state to state and may help with medical alert devices. Often, they operate very similarly to the HCBS programs and pay around the same as that program as well. While getting assistance for a medical alert monitoring device may seem difficult, don’t give up. These devices can save lives in medical emergencies, and it’s vital that those who have fallen before or may fall again have one of them. Finding financial assistance may seem like an uphill battle, but it’s well worth it. Remember when researching medical alert device companies, always ask what discounts are available. Most companies will give discounts for AARP members, advanced payment discount and more. If you need additional help finding the best medical alert company to use, you can check out MobileHelp reviews on our site as well as many others!